For over a century the Lypiatt family have been custodians of the ‘Squid and Teapot’. The current landlord, Rufus Lypiatt, often relates how, as a youth, his father, Spencer, was invited to join the Passamaquoddy trader, Joseph Dreaming-By-The-River-Where-The-Shining-Salmon-Springs on one of his excursions to the mainland. At the time of this tale Joseph would have been in his late sixties. Although still fit and strong, he had been making fewer and fewer trips across the treacherous channel in recent years. The pressing reason for this latest voyage, however,was to procure a new lidded-bucket for the Night-Soil Man, Randall Middlestreet, who had recently taken on an apprentice. While the pair were away the weather deteriorated badly, forcing them to spend a night in Portland. Joseph decided that this was the perfect opportunity for Spencer to be introduced to the marvel that was the Movie Theatre, which that night was screening the recently released musical film, “South Pacific”. To say that Spencer was entranced would be an understatement. It was a once in a lifetime experience for him that he cherished until his dying day. Whether or no they have seen the film, most people are familiar with the show-stopper “There is nothin’ like a dame”. It is one of those tunes that, once heard, is almost impossible to shake out of your head (except for the slightly recitative and unwhistleable bits which include a complaInt about not having a reason for putting on a clean white suit, which everyone tends to forget). So it was with Spencer. He hummed it incessantly. By the time they were back to Hopeless, Joseph was thoroughly sick of hearing it. Spencer, however, was completely hooked and decided that the islanders should all share the benefit of that catchy, but somewhat irritating, tune. Blissfully oblivious to the concepts of plagiarism and copyright, he put his own words to the main melody and sang it to anyone who would listen, or indeed, to anyone who gave every indication that they had absolutely no intention of listening. To prolong the agony, Spencer insisted on inserting the chorus after each stanza, a device that Messrs Rogers and Hammerstein wisely decided not to employ. We’ve got werewolves, wights and ghouls. That drag you into pools. 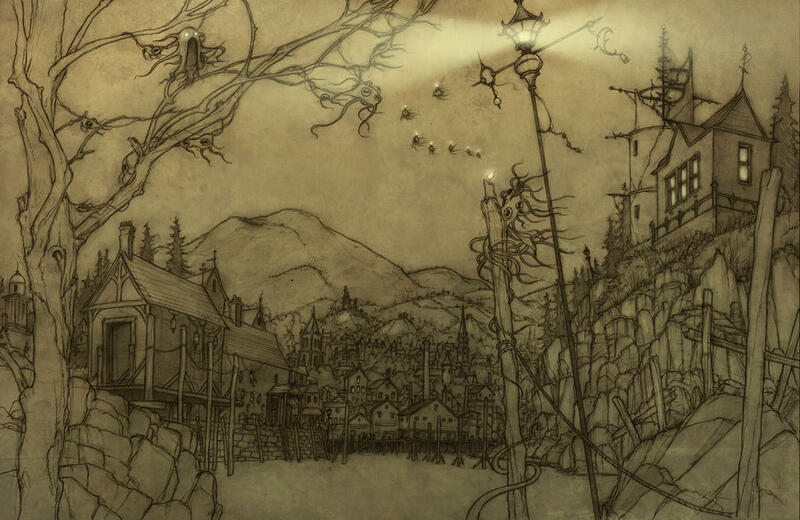 If you’re living on Hopeless, Maine. And the Eggless Woeful Dane. And coffee that grows hair. That might drive you insane. And a Night-Soil Man as well. (It’s a shame about the smell). We’re a really friendly bunch. If you’re fond of fog and rain.